If you have ever seen Monsters vs. Aliens, surely you remember “The Missing Link!” Voiced by the talented, Will Arnett, this wonderful character has all the love of a b-movie character and a beer belly to boot. The Missing Link, also known as simply “Link“, is a 20,000-year-old fish/ape like creature who acts like a jock, but is really just out of shape, in the tv series Link has gotten back in shape and started working out. He was frozen in the last Ice Age and thawed out by scientists. He was captured in 1961. When he escaped, he went back to his old lagoon, found it had been turned into a resort, and started terrorizing the tourists. 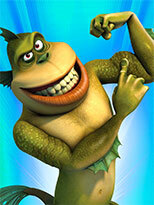 The Missing Link is yet another great monster to go on our Top Monster List! Read more about this lovable amphibian here.